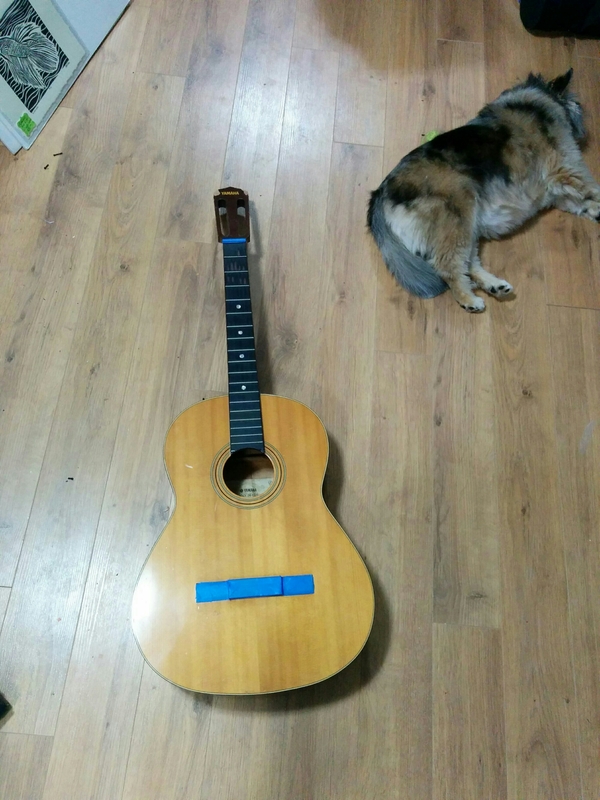 OK so I came down sick with a cold and haven’t had a chance to start on the guitar asides from prime it. I’ve been passing out pretty hard after the kids are in bed the last few nights so haven’t gotten anything done really asides from basic survival lol. I’ve been wanting to dabble in hand stamping for awhile now but just haven’t gotten around to it until now, when I was asked to do a custom order as a Father’s Day Gift. So much fun 🙂 I’ll post pics of the completed project later. This week however, I have to finish that order, go to the Farmers Market Thursday and I have the Downtown Sale on Saturday so I’m thinking the guitar will have to wait til next week sadly…but I do have yet another project stewing in my brain that involves a pair of wooden clogs 😉 but I’ll save that for another post. For now I’ll say goodnight & Cheers! This entry was posted in 2015 Jewelry Creations, art discussions, commission, creative, events, female artist, For Sale, Fort Saskatchewan, Guitar, Home Studio, In Progress creations, Inspiration, Jewelry, Musical Instruments, My Creations and tagged Art and Jewelry, Downtown Garage Sale, Farmer's Market, Father's Day, Fort Sask, hand stamping, Hand stamping supplies on June 17, 2015 by Amanda. So, back in 2014, I was approached to do another commissioned guitar that I’m going to share with you today. Why am I only posting about this now, you may ask? I was asked to keep it on the down low because it was for a company that was, at the time, in the final stages of app development and would be launching a beta version soon and hadn’t made an official public announcement yet. So, I kept it Hush-Hush. Until today, that is, as I see they are fully up and running and downloadable. He wanted it for the headquarters of his new biz and asked that it include their logo (another reason I couldn’t share pics ’til now). Of course I agreed because I love a challenge and I love painting, so it was a win-win. Plus, it gave me one more piece to add to my Colour of Music series. After working out all the boring details & layout, I was given free rein to start work on the piece. A few weeks of serious painting later, (from which I’m still finding paint splashes in my studio) I was finished and ready to ship in early November. Without further ado, here is Wild Orange–Gig Town’s Commission. Also, here are a few pics that Gig Town has used. Also, go check out Gig Town and Download their App to explore lots of awesome musicians! Oh, and if you want to commission a custom painted guitar, I’m your Gal! Here are some of the other pieces I’ve had commissioned and sold. This entry was posted in 2015 Artwork, Abstract, acrylic, Art, canada, Etsy Shop, female artist, For Sale, Fort Saskatchewan, Guitar, Musical Instruments, Paintings, photos and tagged Abstract, acrylic, Alberta, Amanda Milke, Art, art commission, Artist, Canada, Canadian Artist, electric guitar, gig town, painted guitar on May 26, 2015 by Amanda. Don’t you just love Fall! Spring & Summer are great but there’s just something about Fall that’s lovely. Crunch of crisp leaves, red, orange, yellow & brown earthy pallet of colours, cool fall air and the smells of Harvest with its baking & preserving. Yep definitely my favourite season. But with the arrival of Fall we have to bid adieu to Summer and with it the end of the Farmers Market. This Thursday is our last Farmers market for the season. It’s been a great year with so many wonderful customers! I look forward to next years…though admittedly I am looking forward to the break from setting up my tent and being at the mercy of Mother Nature..(who I swear saved all her “colourful” weather for Thursday nights). But all the same it was a wonderful summer, met some wonderful customers and worked beside some talented vendors and best of all got to watch my girls grow and experience the excitement of the weekly market. As the saying goes, there is a season for everything and as we bid farewell to Summer with its outdoor markets we now move into Fall with its indoor venues and upcoming Christmas sales. I’m especially looking forward to working on new inventory! So check back often as I start to showcase some new creations and post about my upcoming venues. It looks to be a busy & productive season. 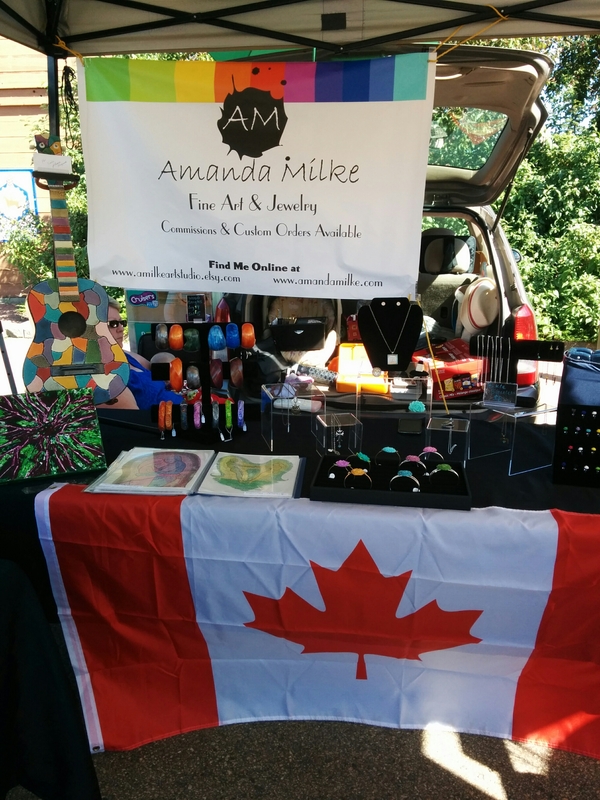 This entry was posted in 2014 Artwork, Art, Art Events, canada, Christmas, creative, events, Fort Saskatchewan, Guitar, Home Studio, In Progress creations, Jewelry, Life, musings, My Creations and tagged autumn, Christmas market place, Fall 2014, new season on September 22, 2014 by Amanda. Here is the latest installment in my Color of Music Guitar series titled: Hallelujah! I called it Hallelujah because it reminds me of those beautiful imperfect Stained Glass windows you find in the old churches. Also every time I look at it I can almost hear “Hallelujah” being played on it. 2-It’s the only one in the series that wasn’t a commission. Meaning, it’s looking for a musician or art lover to take it home. This entry was posted in 2014 Artwork, Abstract, Art, Artist, canada, Etsy Shop, exhibit, For Sale, God/Religion, Guitar, Home Studio, Musical Instruments, My Creations, Paintings, Pebeo paint and tagged acoustic guitar art, colour of music, custom painted guitars, Hallelujah, Jeff Buckley, Leonard Cohen, Series on May 23, 2014 by Amanda. I don’t really have a whole lot to say, just been busy working away. That being the case, I thought instead of writing a lengthy entry on how things are progressing I’d simply show you. 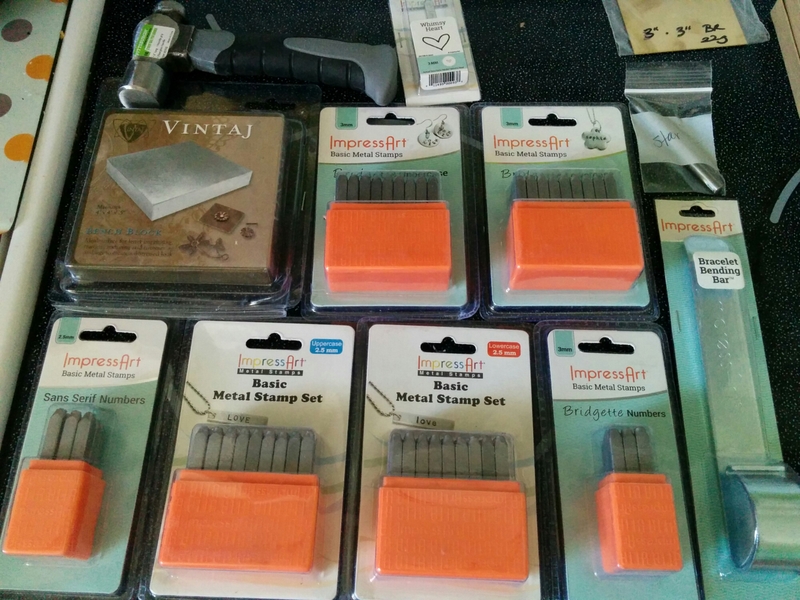 Here’s what I’ve started or have done. Most of these pieces have been posted to my Etsy store with the exception of the new entry into my “colour of music” series guitar that is still in progress. This entry was posted in 2014 Artwork, Abstract, Art, canada, Etsy Shop, Farmer's Market, female artist, For Sale, Fort Saskatchewan, Guitar, Home Studio, In Progress creations, Jewelry, Musical Instruments, My Creations, paint, Pebeo paint, photos on May 15, 2014 by Amanda.